George Graham reviews Chris Thile's "Not All Who Wander Are Lost"
In the early 1980s, the so-called New Acoustic music scene emerged. Founded by artists like David Grisman and the members of New Grass Revival, the style took the instruments of bluegrass, and brought them to very untraditional areas, including a good deal of jazz influence. While the commercial pop scene of the day was rather insipid, the New Acoustic genre in the 1980s gave us some really outstanding music, expanded musical boundaries, and raised the bar considerably in terms of level of musicianship. Although most of the artists who started the scene remain active, as recently as two years ago, I fretted that there was just not as much interesting music coming out of the scene, and that perhaps New Acoustic may have pretty much played itself out, with Béla Fleck going electric with his Flecktones and New Grass Revival long separated, and artists like Tony Rice returning to more traditional bluegrass. But since then, there has been real New Acoustic renaissance, and the music has never been better. This week we have a new CD that is nothing short of phenomenal. 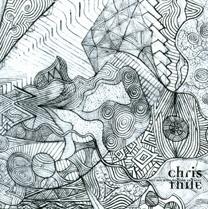 It's by 20-year-old Chris Thile, and it bears the title Not All Who Wander Are Lost. There are several factors that have contributed to this reinvigoration of New Acoustic Music. Probably the most potent was the hit movie O Brother Where Art Thou, which featured bluegrass prominently in its soundtrack. As much as I am miffed that it takes something like a commercially successful movie to make people aware of worthwhile music that has always been there, it nevertheless has become a very good time for bluegrass, with veteran performers like Ralph Stanley and Del McCoury suddenly finding wider audiences, and long-time country musicians with roots in bluegrass, like Ricky Skaggs, Patty Loveless and even Dolly Parton doing straight acoustic bluegrass albums with the help of some of the outstanding musicians who have been part of the New Acoustic scene. Also, banjo virtuoso Béla Fleck has made a couple of acoustic recordings, bassist Edgar Meyer has been doing a series of albums that combine bluegrass and classical influence, which has attracted classical audiences, and even Fleck himself recently did a classical CD. One of the major factors that propelled the New Acoustic scene twenty years ago was the appearances of a younger generation of players, like Béla Fleck and Sam Bush, who approached the music from a new direction and also brought a remarkable level of musicianship, previously rare among bluegrass pickers. Now bluegrass and New Acoustic music are again being infused with new blood, with the most notable examples being Alison Krauss, who emerged a few years ago as a teenager, and Nickel Creek, whose members range from their late teens to early 20s. Again, the level of musicianship has been raised even higher, and the range of influences further widened. Nickel Creek in the year and a half since their first widely-released CD, has become one of the most acclaimed new bluegrass ensembles to appear in many a year, and have perhaps because of their youthfulness, attracted a fair amount of media attention, including some of the commercial country video channels. Earlier this year, Nickel Creek's guitarist Sean Watkins released his own album Let It Fall, and now their mandolinist Chris Thile is out with Not All Who Wander Are Lost. Chris Thile definitely falls into the category of prodigy. He said in a recent interview that he distinctly recalls being taken to see a bluegrass band at age 2, and from that moment on, playing the mandolin was what he wanted to do. His parents finally got him one at age five, and he has not wavered in his passion for the instrument. He released his first solo album called Leading Off at age 12. In addition to his membership in Nickel Creek, a group that formed among childhood friends growing up in Santa Monica, California, Thile has also appeared on Dolly Parton's bluegrass CDs, and has been doing other studio work. While Sean Watkins' CD has some vocal tracks, it was mainly instrumental. Chris Thile is one of the principal vocalists in Nickel Creek, but his CD is entirely instrumental, and a real showpiece not only for his playing but his first-rate composing. The CD boasts appearances by some of the most significant names in the genre, including Béla Fleck, Edgar Meyer, Dobro master Jerry Douglas, fiddler Stuart Duncan, plus guitarist Bryan Sutton, and, when Edgar Meyer is not playing, Nickel Creek's bassist Byron House is heard. Needless to say, the quality of musicianship is nothing short of breathtaking. Though they play different instruments, Chris Thile and Béla Fleck have much in common: both are prodigies -- Fleck was also in his early teens when he began to attract national attention, and recorded his breakthrough album at age 20 -- and Thile, like Fleck, is more than just a virtuosic picker, but a talented composer who creates interesting and musically quite sophisticated pieces with a harmonic approach more in common with jazz than bluegrass, and complexities like shifting or unconventional rhythms reminiscent of art rock. And like Fleck, Thile can make his complex music sound very appealing and melodic. This generous, hour-long CD has compositions that range from brooding and almost classical to funky to joyful to reminiscent of more traditional bluegrass -- though almost always with some twist. Chris Thile's new CD Not All Who Wander Are Lost is a remarkable recording by a 20-year-old who together with some of the best players in the New Acoustic music world, combines astonishing musicianship with very impressive composing. Not only is there some fancy picking, but the tunes themselves are really interesting, striking that rare balance between musical sophistication and a melodic, appealing sound. This is acoustic music that can be downright exhilarating. Thile has already emerged as one of the bright new lights in bluegrass, and this CD establishes him as a major figure on the instrumental New Acoustic scene. Our sound quality grade for this CD is an "A". The dynamic range could have been a little wider, but the acoustic instruments are nicely recorded and the ebb and flow of the music is rather well-preserved on the recording. One has to feel a little sorry for those whose exposure to music is limited to the mass commercial media. Under such circumstances, it would be easy to become thoroughly discouraged by quality of music coming from the younger generation of video-oriented bands and manufactured teen pop stars. Chris Thile certainly explodes that notion about the younger generation with perhaps the most impressive New Acoustic style album in years.